My husband recently asked me to bake him some homemade chocolate chip cookies. 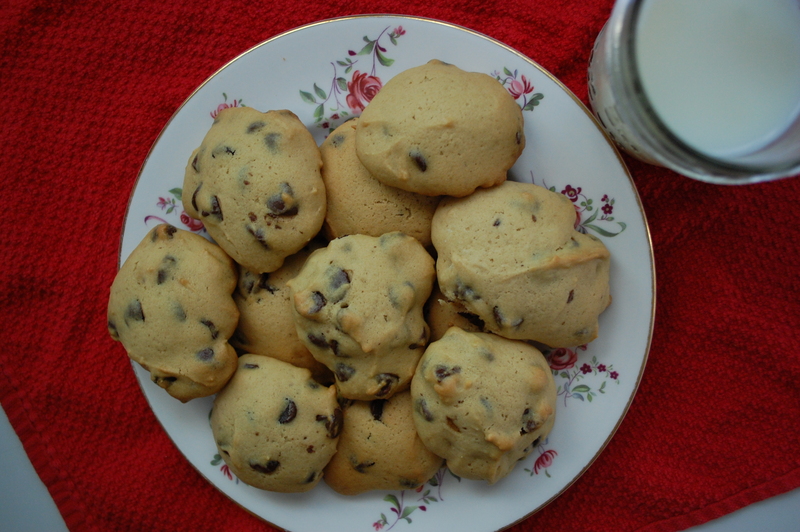 It’s a simple request… but it got me to thinking-how did the chocolate chip cookie come to be? Heaven on a plate, don’t you think? I notice a lot of things as I read the cookbooks I’ve collected in the past year… most notably, the lack of certain recipes we consider to be staples today, especially chocolate-based desserts like cakes and cookies. That is surprising to me because chocolate was established in European diets, mainly in drinkable form, and was thought to have medicinal value. (YES!) History.org also says colonial soldiers in the mid and later 1700’s were given a ration of several pounds of chocolate per year. The first time I noticed anything like a chocolate chip cookie was a recipe written by hand by my grandmother-in-law in a cookbook I inherited from her. The book itself was published in 1931. 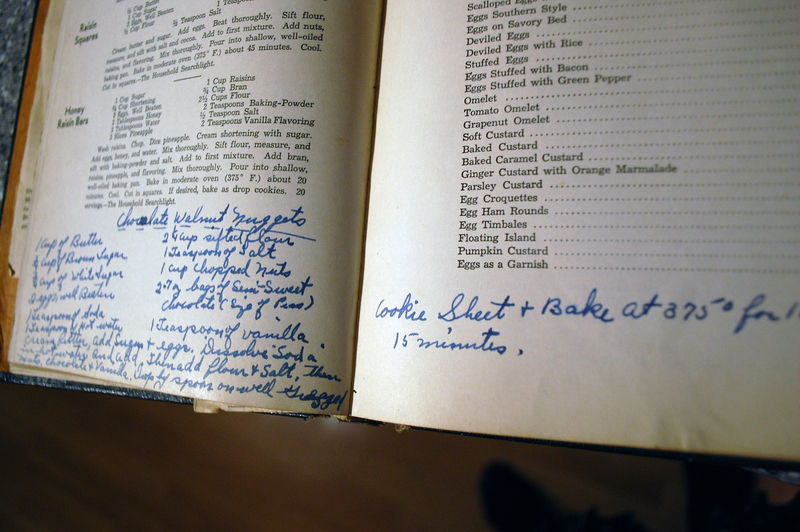 The handwritten recipe from my Grandmother-in-Law, Rosa Roof. 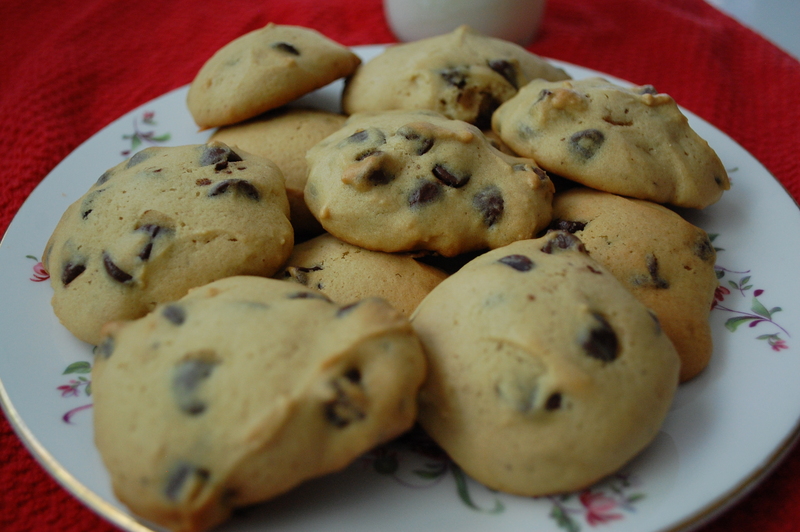 According to several sources, including Foodkitchen.com, Ruth Wakefield invented chocolate chip cookies in 1930 at the Toll House Inn which she and her husband owned in Massachusetts. 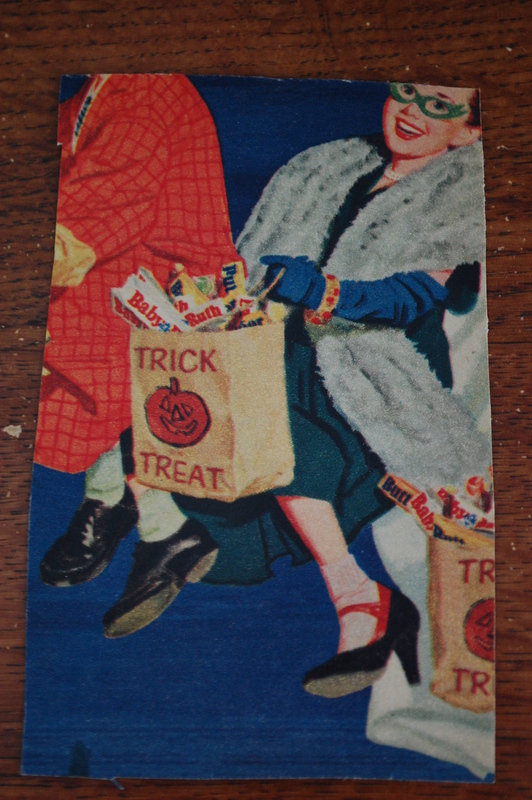 One evening in 1937, she got the idea to make a chocolate butter cookie, so she broke up one of the bars of semi-sweet chocolate that Andrew Nestle gave her. 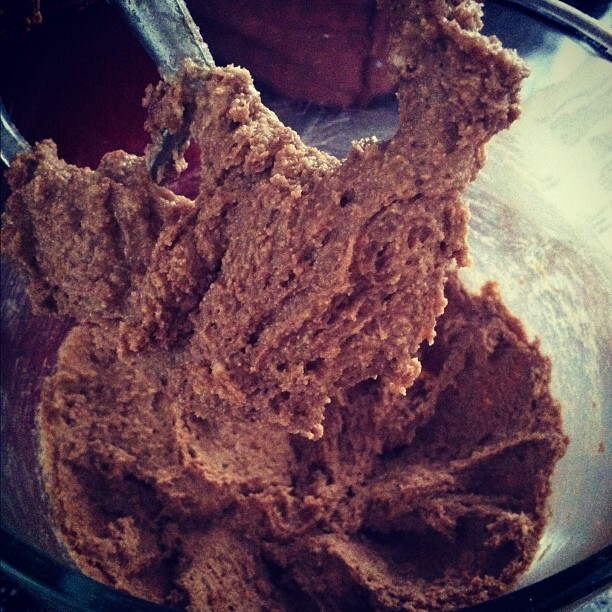 She thought that it would mix together with the dough, melt in the oven & make all-chocolate cookies. The chocolate didn’t melt completely but the cookies were a hit with the guests anyway. Thus, the legend was born. 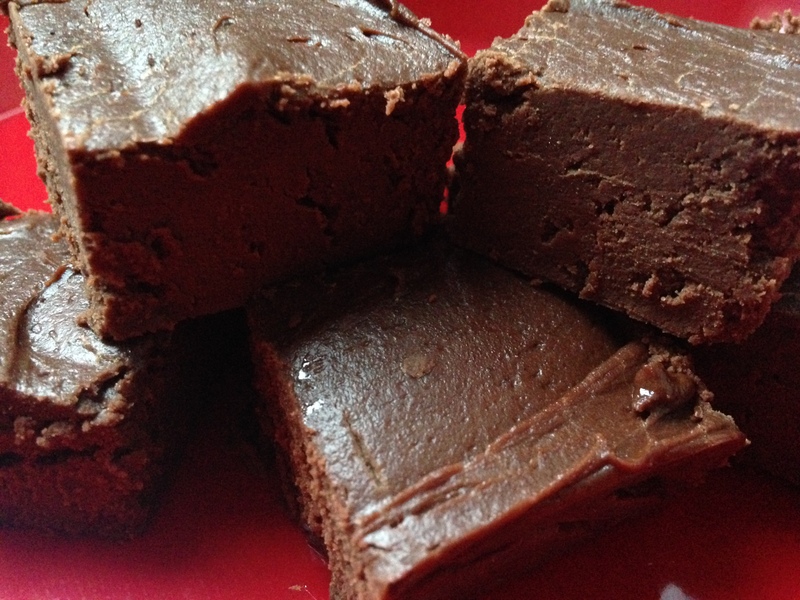 Indeed, the recipe I found in my grandmother-in-law’s cookbook is actually title “Chocolate Walnut Nuggets” and it calls for bars of chocolate, cut into pea-sized chunks. I used modern chips. 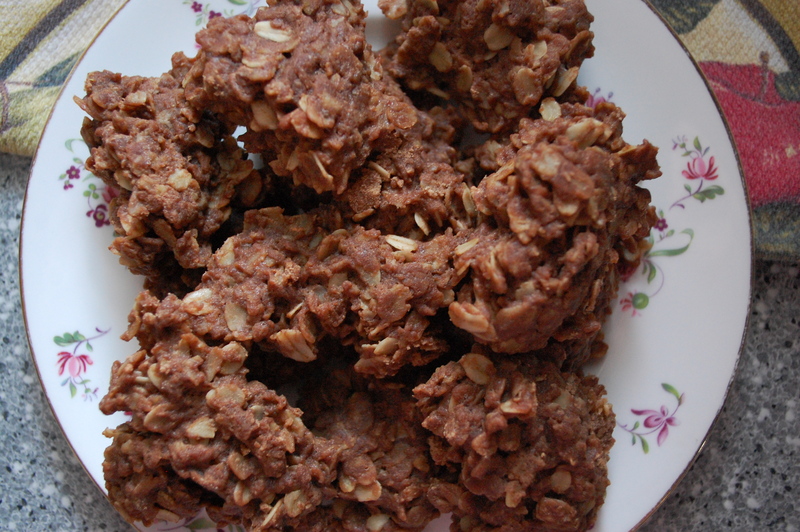 I also did not include the walnuts in my batch, as no one in my house really likes them in cookies, but I’ve left them in the ingredient list in case you would like try this the truly vintage way. 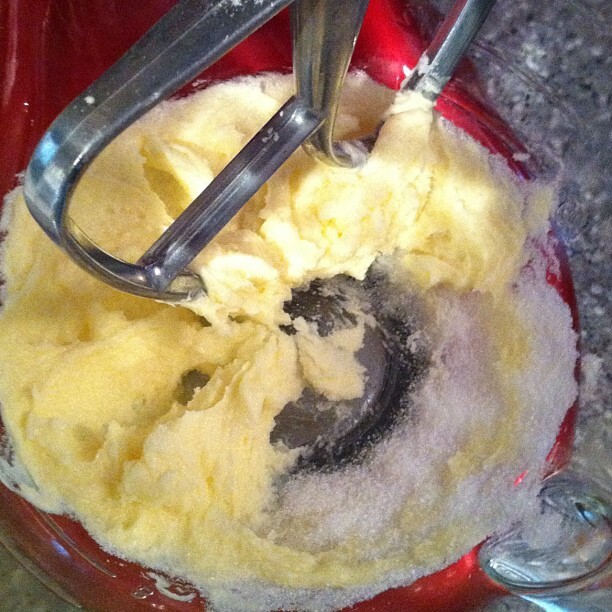 Cream the butter, sugar and eggs in a mixer. 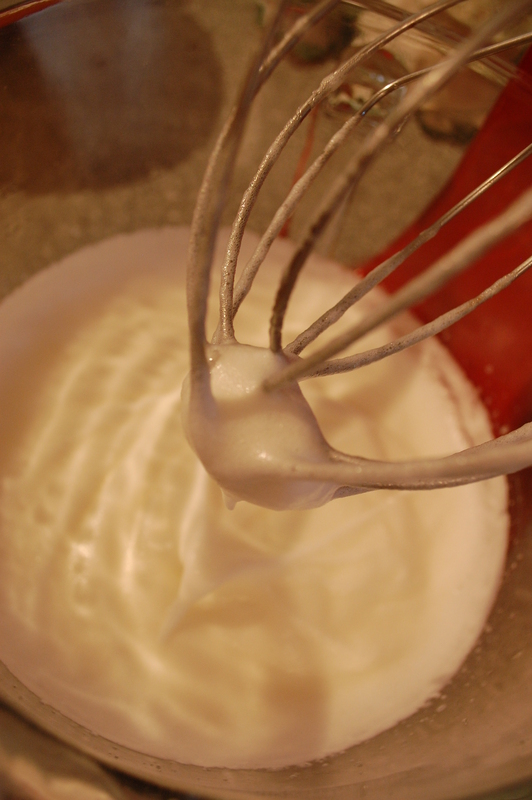 Dissolve the baking soda in the hot water in a small dish and then mix into the creamed ingredients. 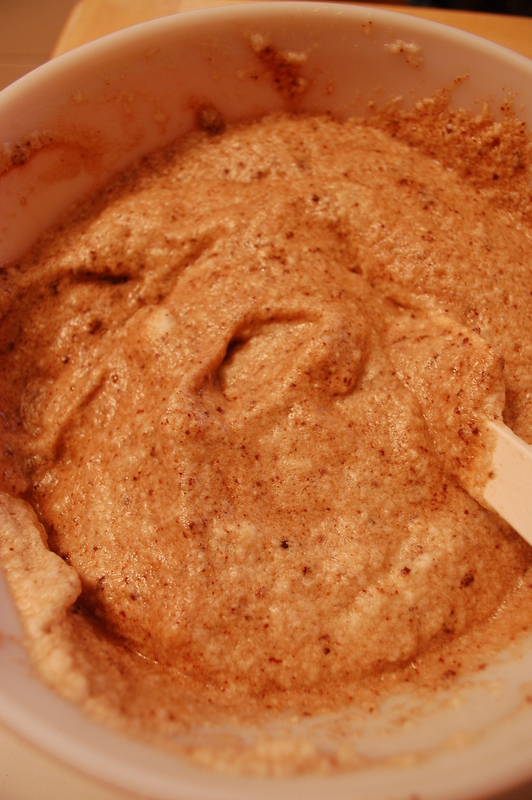 Add flour and salt and mix until well-blended. Add vanilla. Fold in the chips and the nuts if you choose to use them. Looks pretty much like the modern kind! Line cookies sheets with parchment paper. 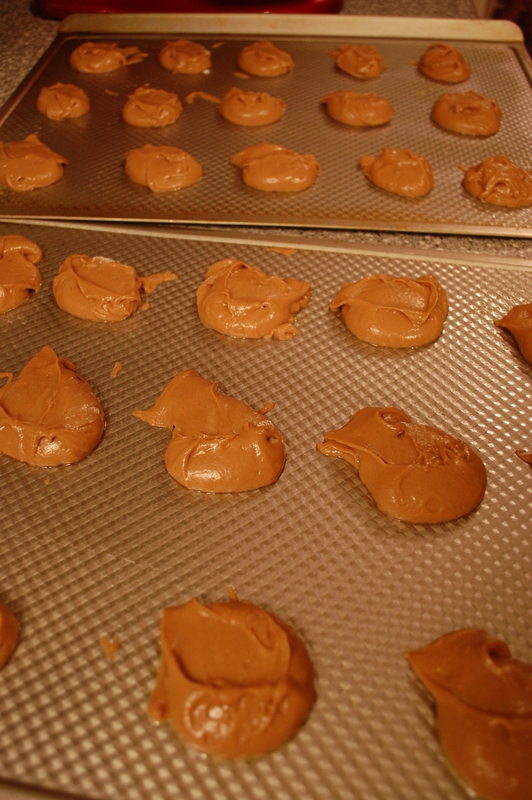 Drop by the spoonfuls onto the parchment and bake for 10-15 minutes. 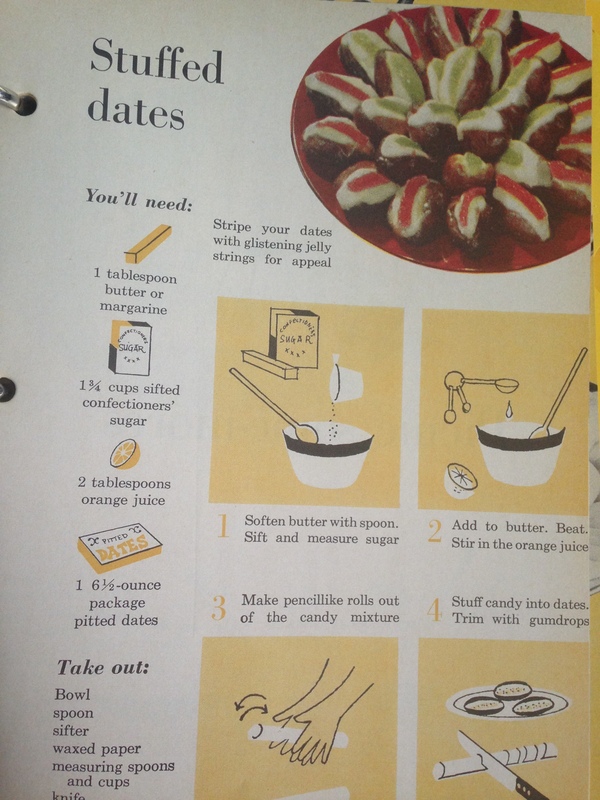 On a recent night, in response to a sudden and undeniable craving for a chocolate cookie, I took a quick look through the cookbook I inherited from my husband’s grandmother. 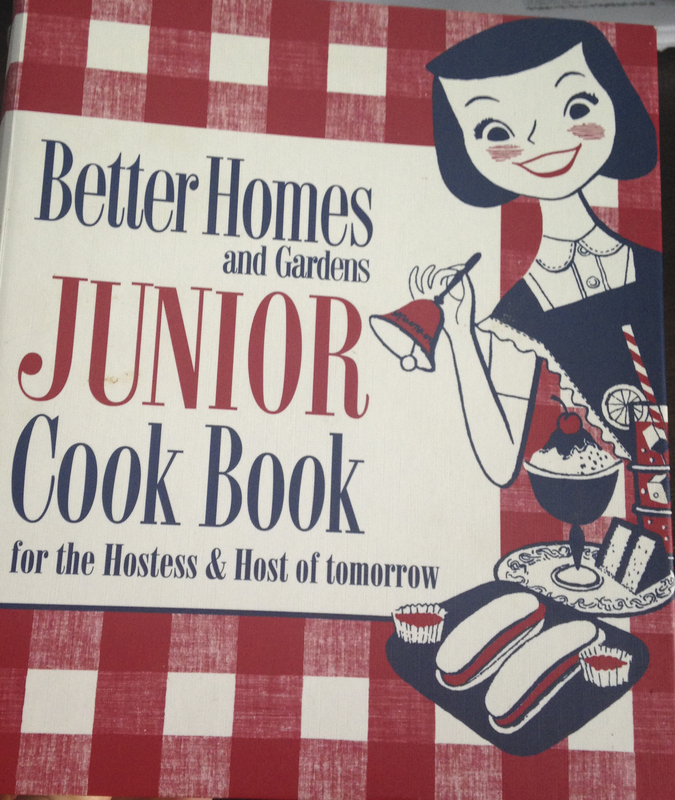 It contains about two dozen clippings and handwritten recipes she slipped into its covers over the years. I vow to try all of them, but this one intrigued me because of the Halloween ad printed on the back! Nice horn rim’s, huh? I think these are supposed to be kids, dressing as grownups for Halloween. Meanwhile, the cookie recipe on the other side of the paper was easy and really good. 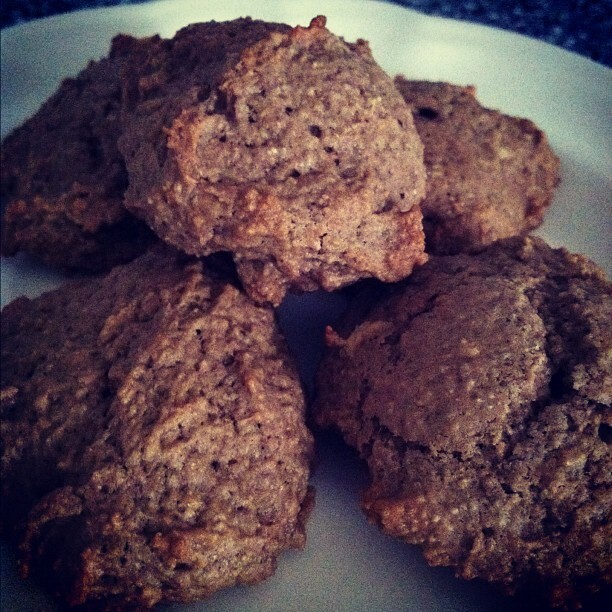 It doesn’t have a strong chocolate flavor but it’s light and fluffy, kind of like a tea cookie. It stands with or without frosting. 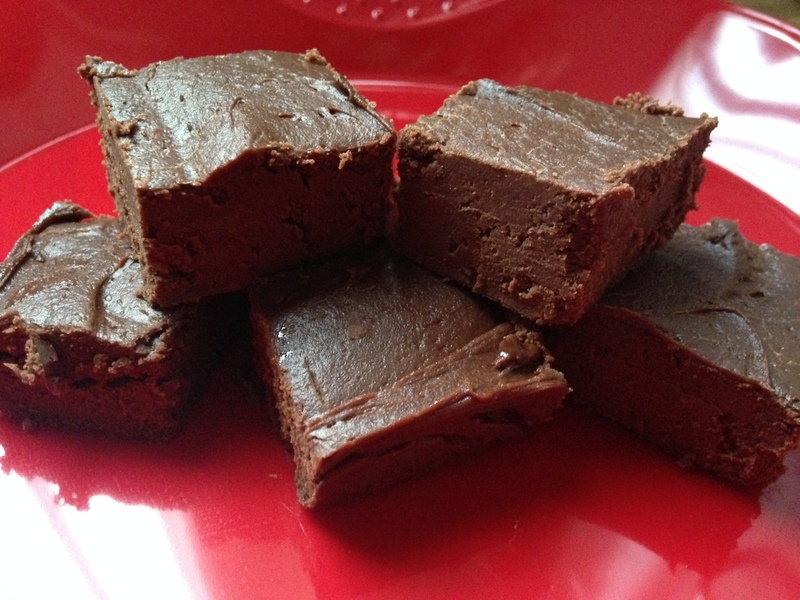 Warm chocolate and 2 tablespoons shortening in microwave on 50 percent power for about a minute or until melted. Mix thoroughly and set aside to cool. Chocolate, melted. Really, I could have just eaten this and been done with it! Blend flour, baking powder and salt-set aside. 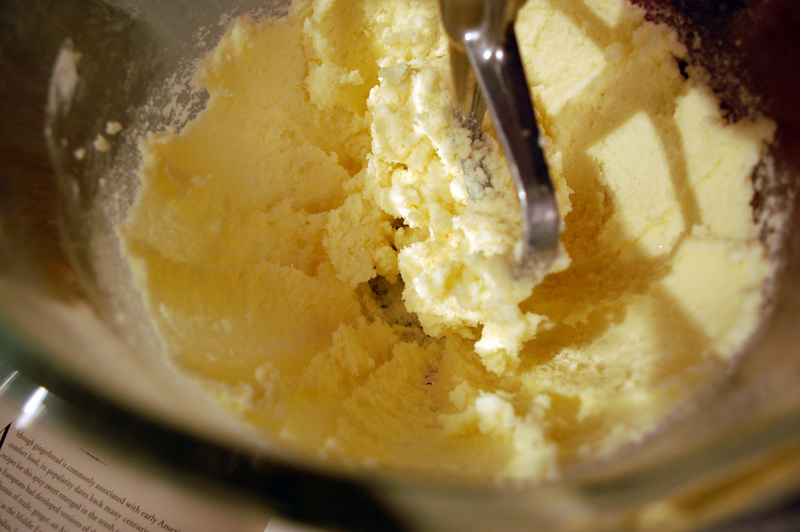 Cream one cup shortening and vanilla extract together. Add sugar gradually, creaming until fluffy. Add eggs and beat thoroughly. 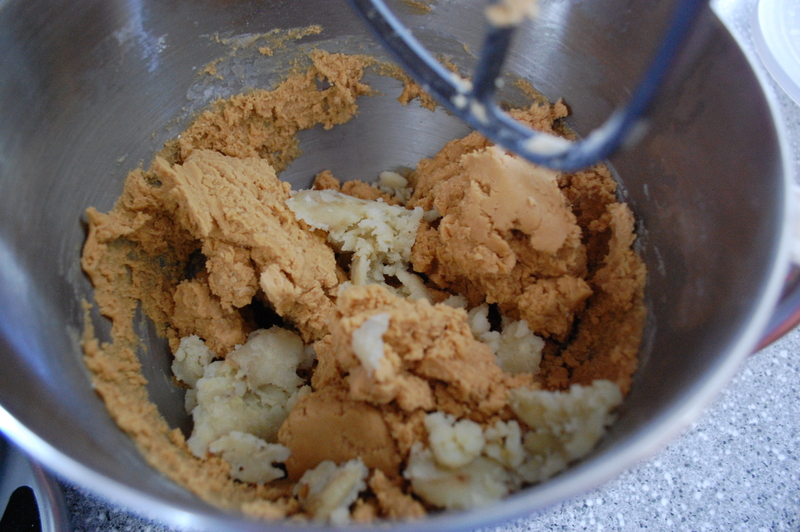 The dough, after the eggs were added. 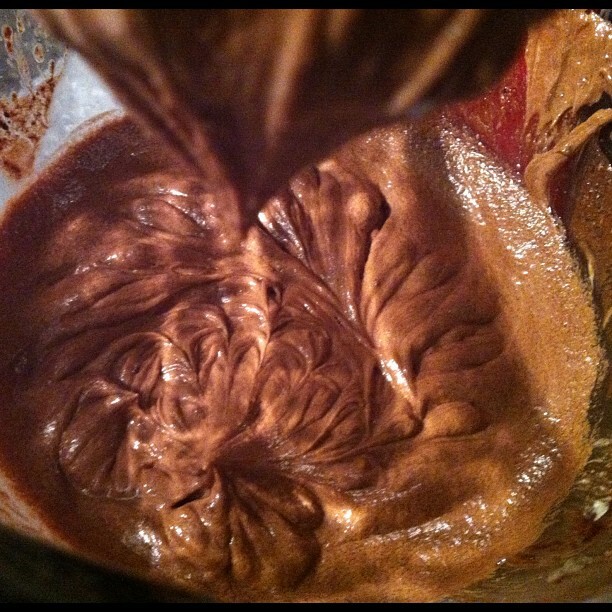 Blend in the cooled chocolate-shortening mixture. 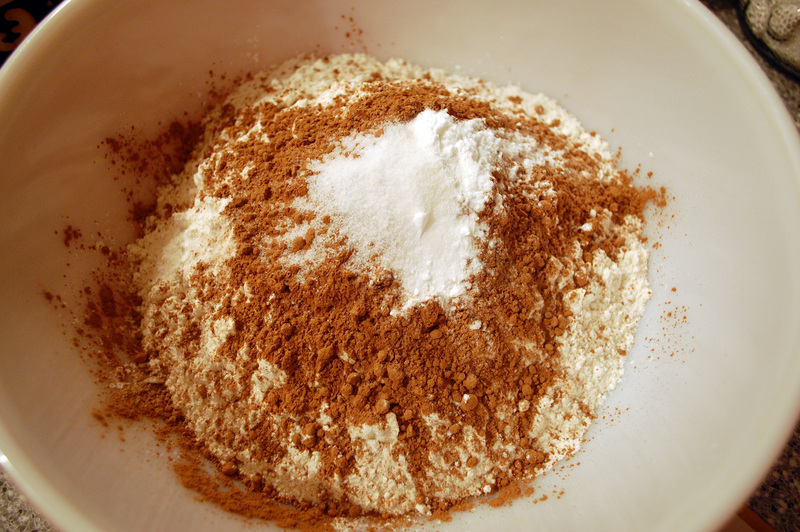 Add the flour and milk alternately in four rounds, blending well after each addition. 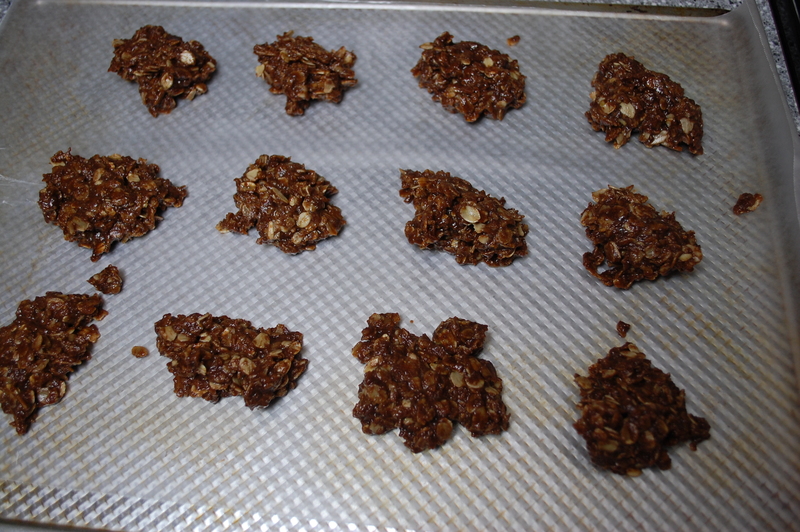 Drop by rounded teaspoons about two inches apart on greased cookie sheet. Bake for 16 minutes. Cool and serve! I took a break from my Jane Austen frenzy to bake another birthday cake. When I asked my co-worker Andy what kind of cake he wished for, he said, “I’d take one of those vintage cakes.” I could have kissed him. After much pouring over recipes, Andy settled on this super-delicious cake from “For Luncheon and Supper Guests” by Alice Bradley. The book was written specifically for the modern woman of the 1920’s, without a staff to produce multi-course meals. 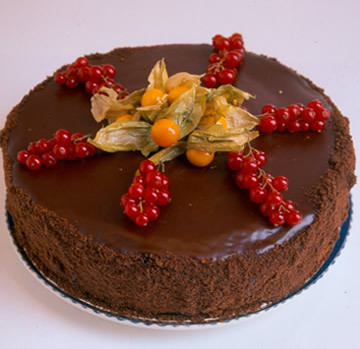 The cake was not difficult to make, although it might seem like it from the number of steps. The frosting is the best part-it was incredibly good! The cake received rave reviews from Andy and my other co-workers and one person has already put in his request for this cake at his next birthday. So, it’s a winner! 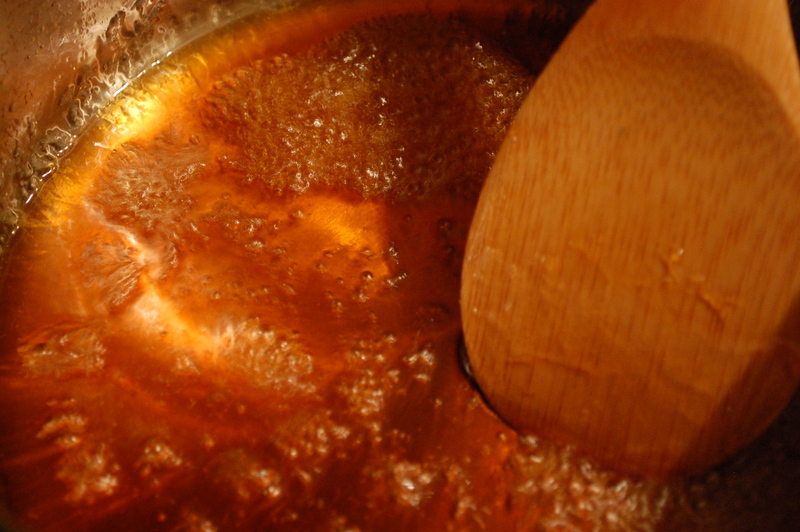 In a saucepan, place ¼ cup water and ¾ sugar. 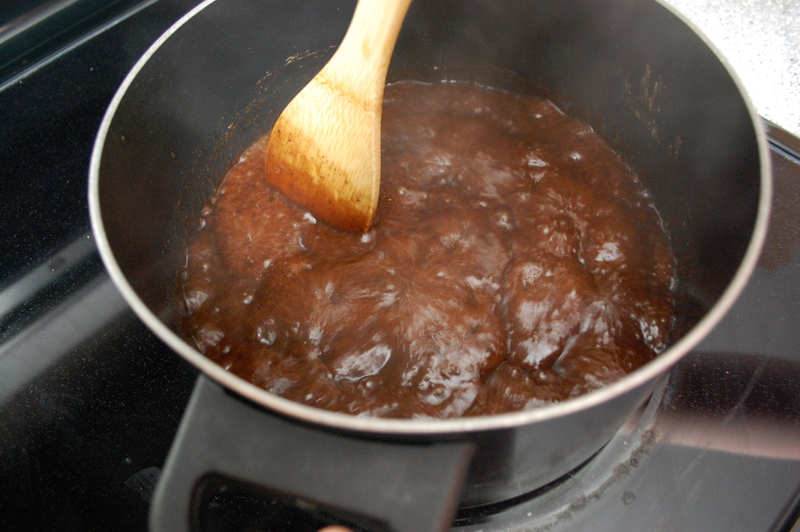 Mix and cook, stirring frequently, until it forms a dark brown syrup, about 15 minutes. 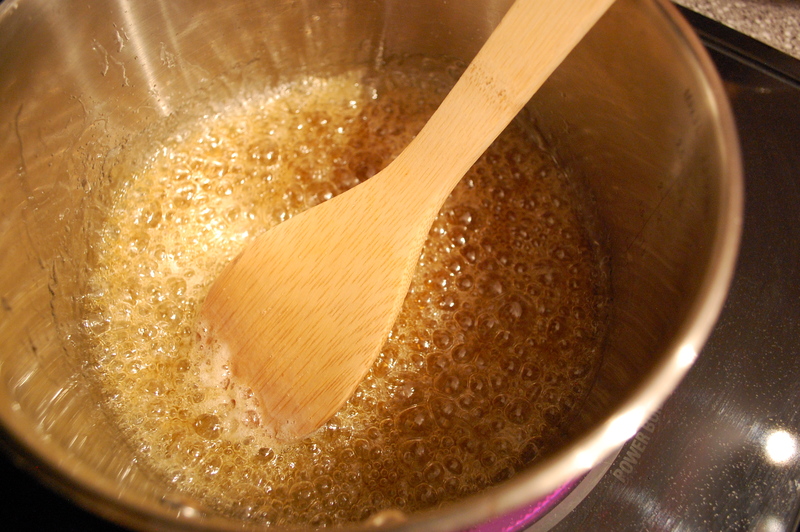 Add ½ cup boiling water and cook until thick (test by taking a wooden spoon and scraping the bottom of the pan. If you can draw a circle and it holds its shape for a few seconds, it’s ready). 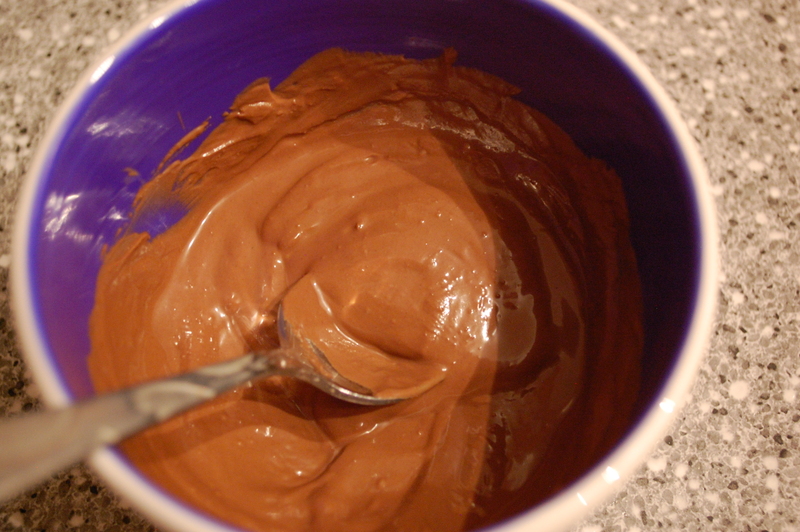 Melt the chocolate in the microwave, one minute at a time on 50% power, stirring until fully melted. Add to the syrup and set aside, covered. Meanwhile, preheat your oven to 400 degrees. 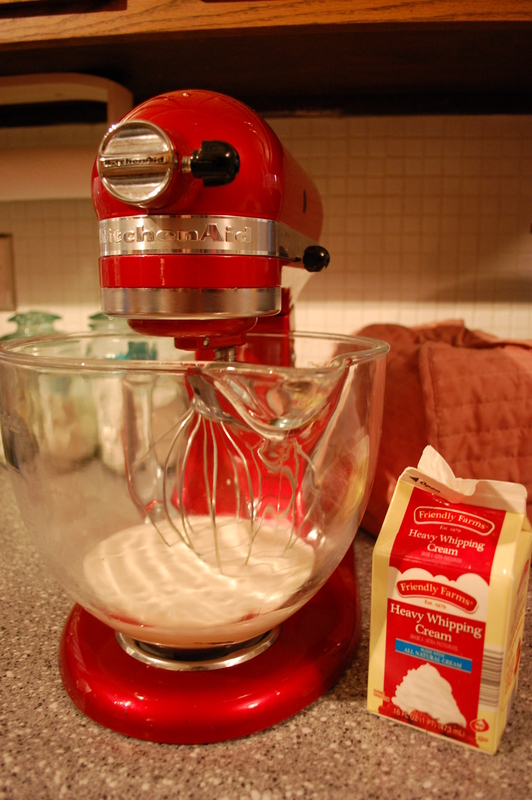 Beat the heavy cream, sugar, and ½ cup water until thick, about 8 minutes on my KitchenAid mixer. 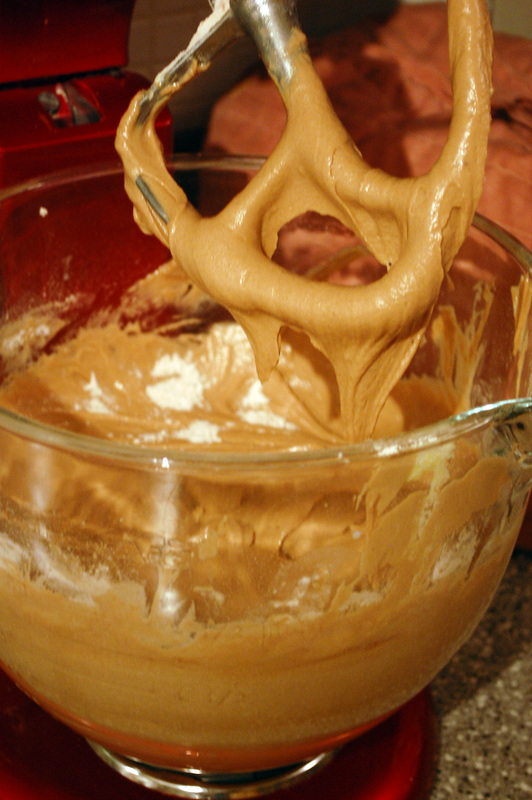 Sift the flour, baking powder and salt together and add to cream and sugar mixture. 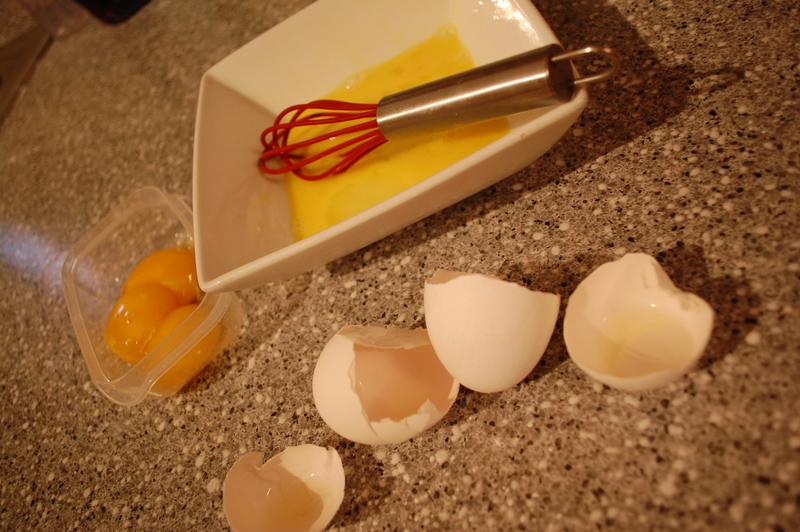 Add three egg yolks and the whole beaten egg. 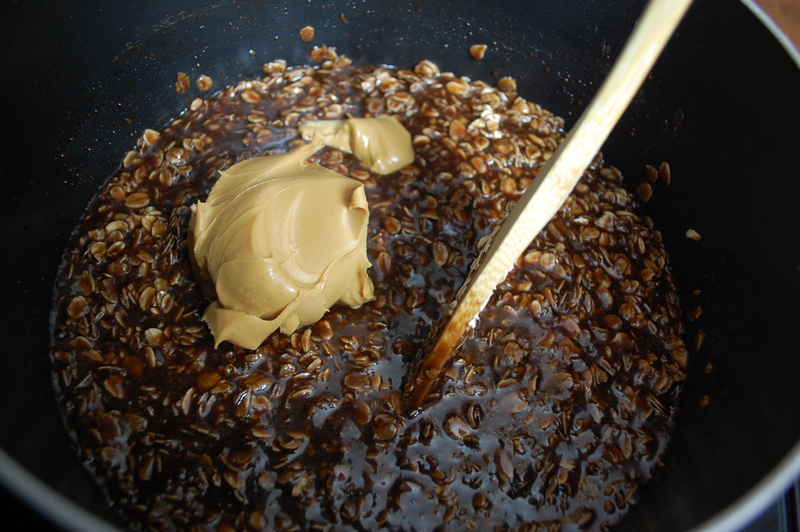 Then mix in two tablespoons of the caramel syrup. 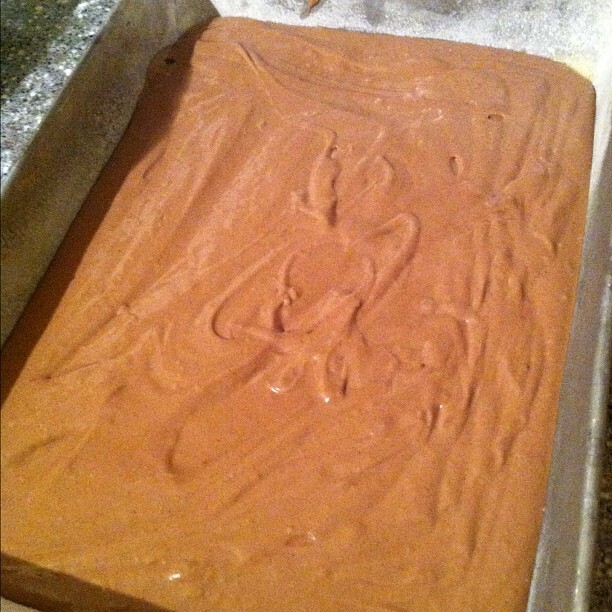 Pour into two 8 inch layer cake pans, greased and floured, bake 15-20 minutes or until golden brown. Watch the layers closely-I find that putting both on the bottom shelf, next to one another, works well with this recipe to prevent burning in such a hot oven. 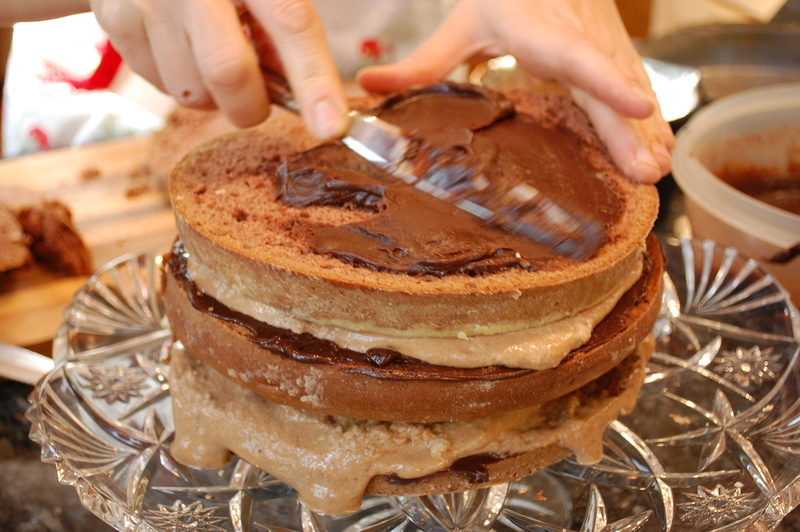 Allow layers to cool before removing from pan. 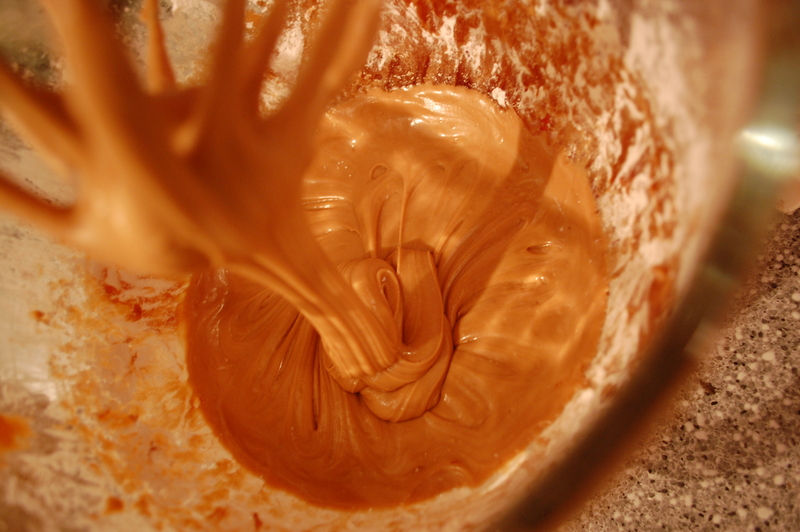 To prepare frosting, boil the remaining chocolate caramel syrup to soft-ball stage (if you can drop a small bit in a bowl of cold water and it forms a soft ball of caramel, it’s ready). 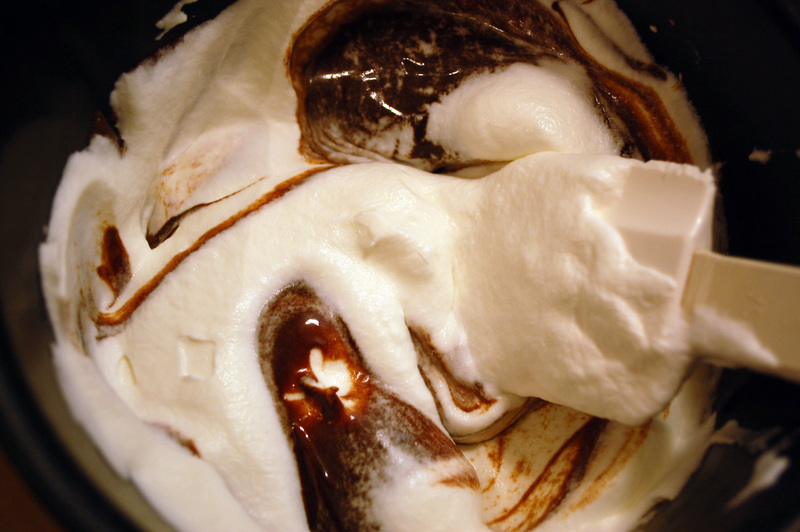 Beat two egg whites until stiff and continue beating while slowly adding the chocolate caramel syrup. Then add the confectioners sugar, a cup at a time, until you get the right consistency to spread. I confess my daughters and I are in the throes of a Regency era obsession. In two weeks, we are attending the Jane Austen Festival in Louisville, sponsored by the Greater Louisville Region of the Jane Austen Society of North America. A co-worker told me today how lucky I am to share such a passionate interest with my girls. Indeed, I raised them on a steady diet of Jane Austen literature and movies but, until a few weeks ago, we really didn’t delve much into the daily lives-or eating habits-of Jane and her characters. So, while we research and create authentic costumes to wear to the festival, I’ve been teaching them about the differences in menu and dining habits of people living in the British Regency Era, from 1795 to 1837. 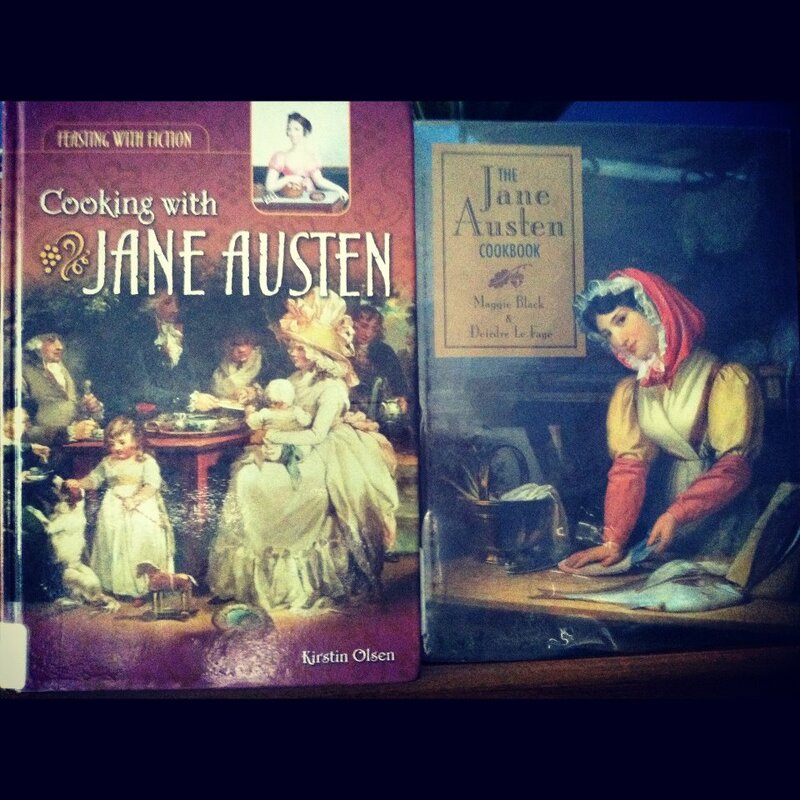 To help, I picked up two cookbooks from the library: “Cooking with Jane Austen” by Kirsten Olsen and “The Jane Austen Cookbook” by Maggie Black and Deirdre Le Faye. 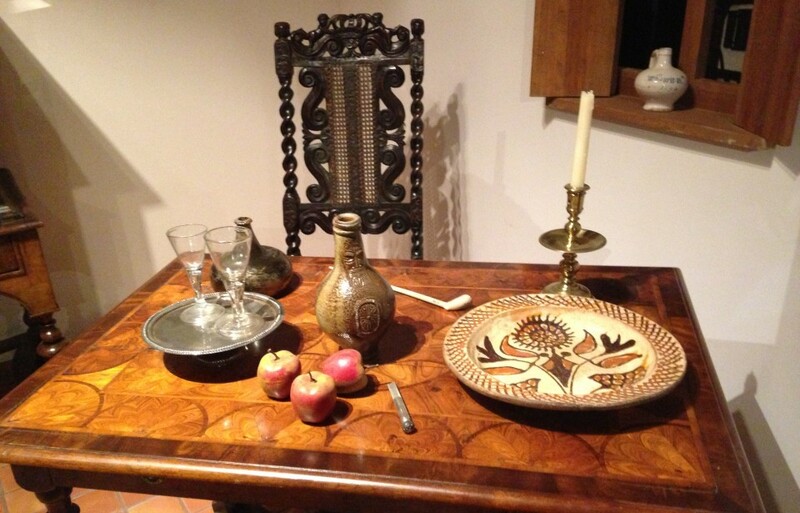 Consequently, you’re going to see a lot of recipes-and learn a lot about regency food-in the next few weeks! 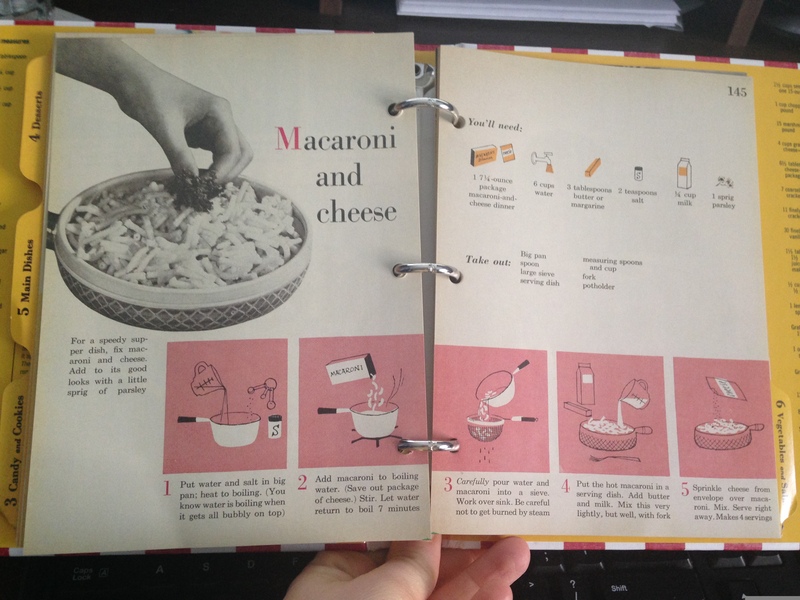 I began cooking from Olsen’s fabulous book. The first 33 pages are spent describing menus, food shopping and preparation, table habits, manners, etiquette, and the general dining schedule of Jane and her family and her characters, which we believe mimicked her accustomed way of life, in some manner. Take six eggs, and put the yolks of four into one pan, and the whites of the whole six into another; add to the yolks an ounce and a half of chocolate, bruise very fine, with six ounces of fine sugar; beat the whole together well, and then put in the whites of your eggs whipt to a froth: when they are well mingled, stir in a little and little six ounces of flour, and put your biscuits upon white paper, like spook biscuits or in little paper molds buttered: throw over a little fine sugar, and bake them in an oven moderately heated. Spray a muffin tin with cooking spray or fill with muffin papers. Preheat your oven to 350 degrees. 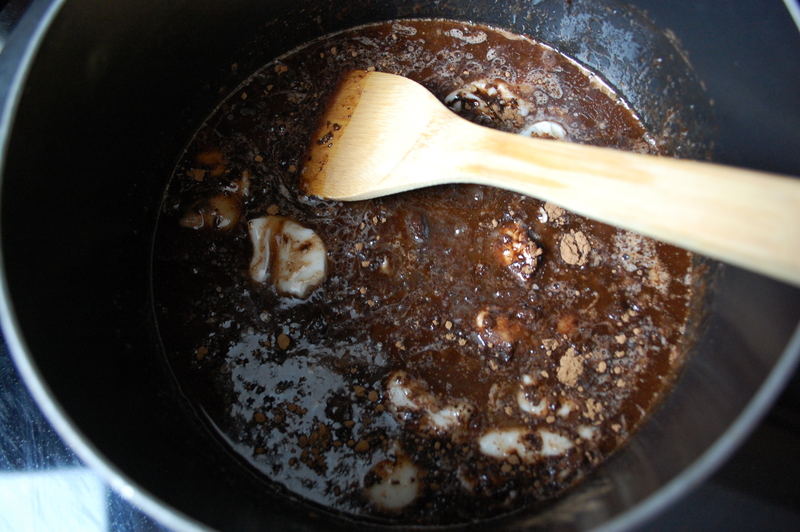 In a bowl, whisk the egg yolks, cocoa, and sugar until they are thoroughly combined. 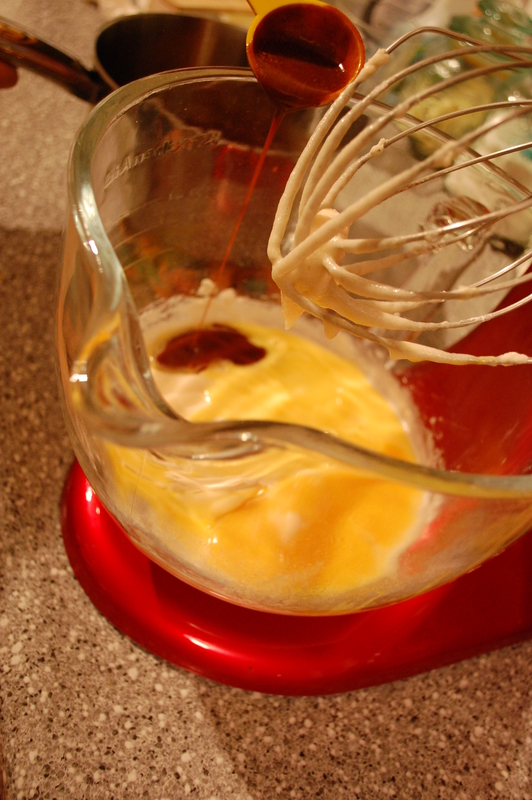 In a mixer, beat the egg whites to still peaks. 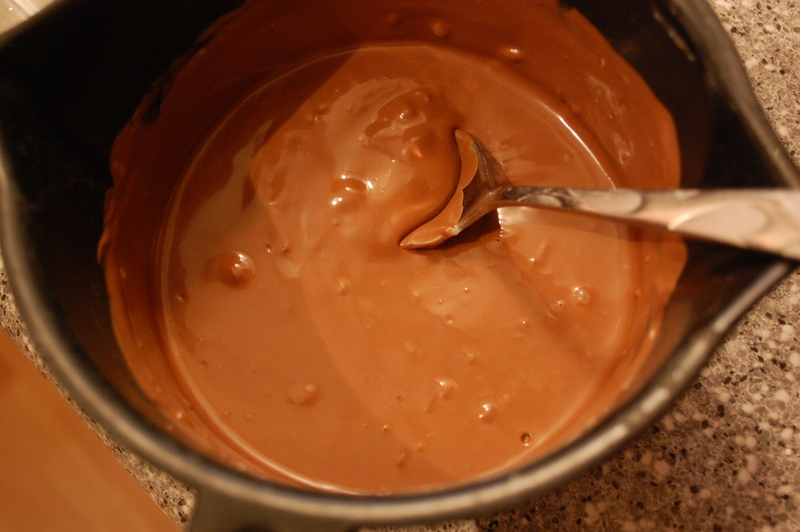 Fold them into the chocolate mixture. 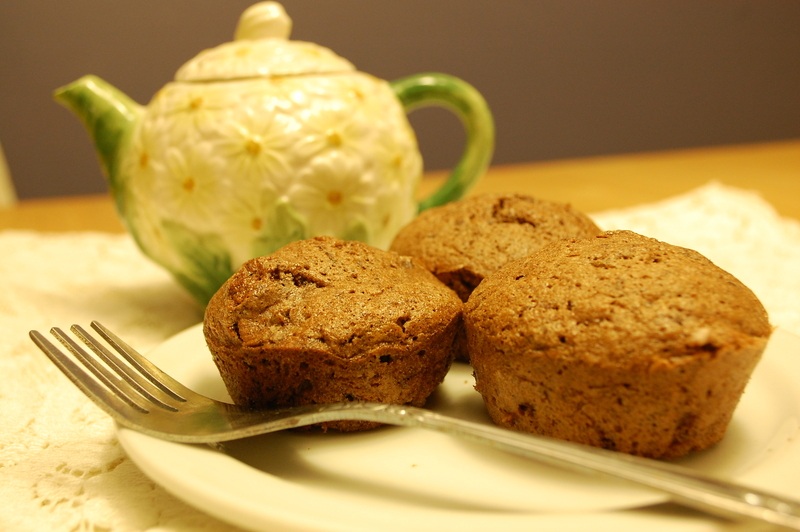 Scoop the mixture by scant ¼ cups into your muffin cups. Bake 30 minutes, rotating the baking sheets midway through the baking time. 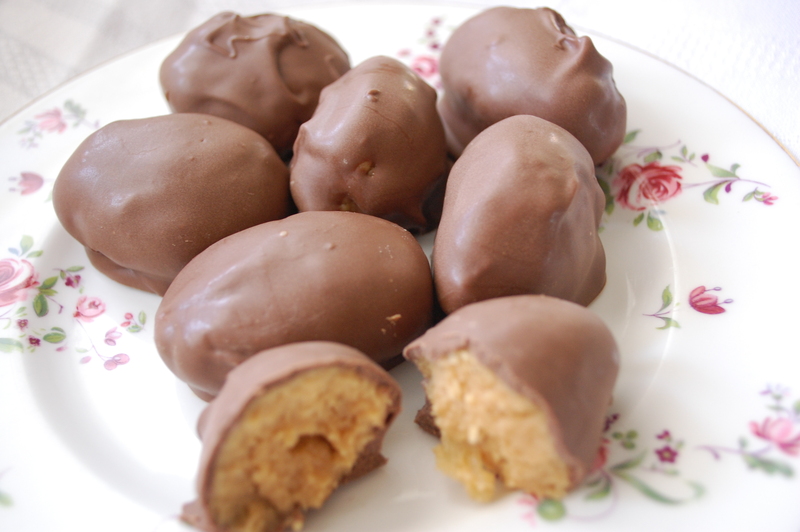 The girls and I loved these-they are chocolatey and sweet. They sort of look like a cupcake but are a little more hearty. If you add a little real berry jam, they are truly delicious. 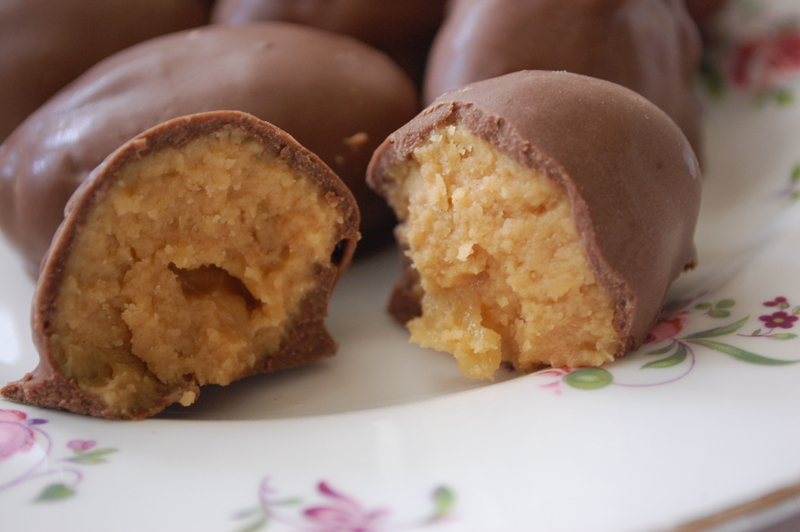 And they’re perfect with tea! My eldest daughter is about to turn 12 years old. We hosted a birthday party for her friends and she requested a chocolate cake. Poor girl. 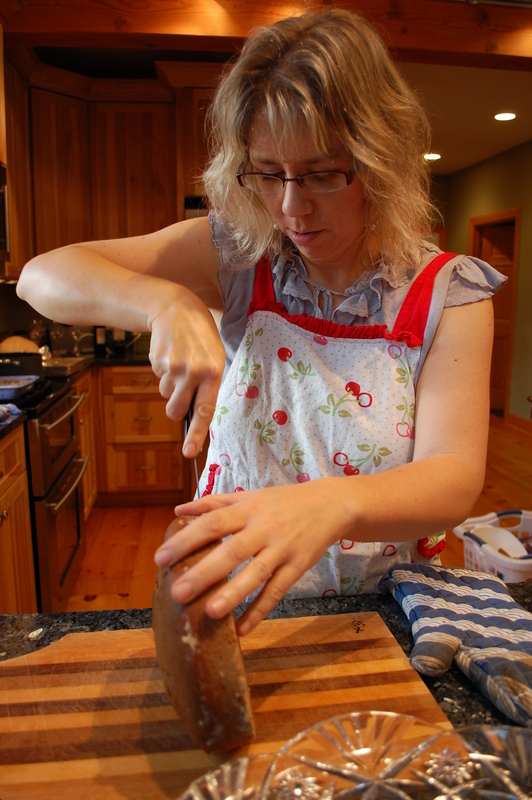 She knows by now that nearly everything I cook is for the blog. Turns out, mom sometimes finds a gem that can pass the approval test of a pack of skeptical 12-year-old girls who think they know everything about chocolate. 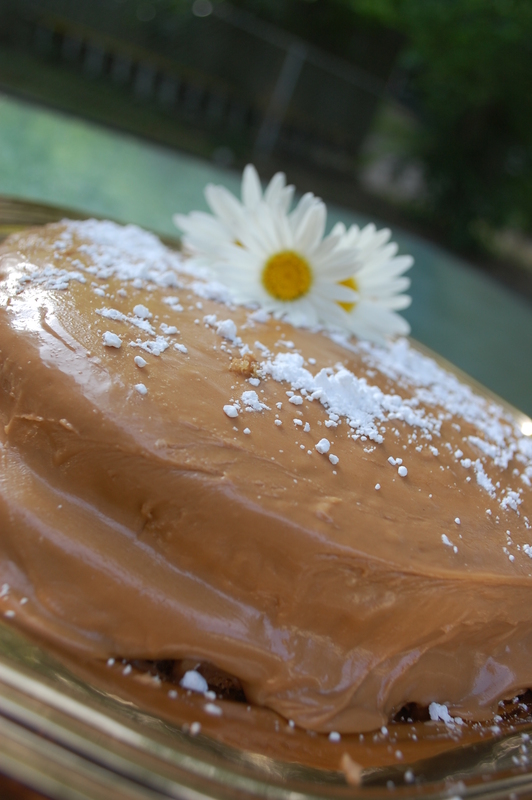 This cake comes from the book “Fifty-Two Sunday Dinners” published in 1913 by Elizabeth O. Hiller. 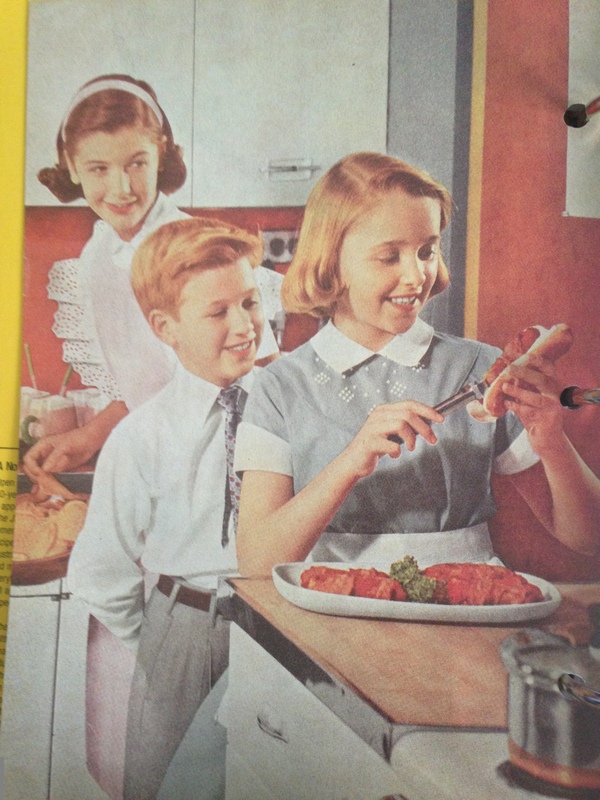 I’ve read that the cookbook itself is a big advertisement for a product called Cottolene, which was a lard made of beef tallow and cottonseed oil. 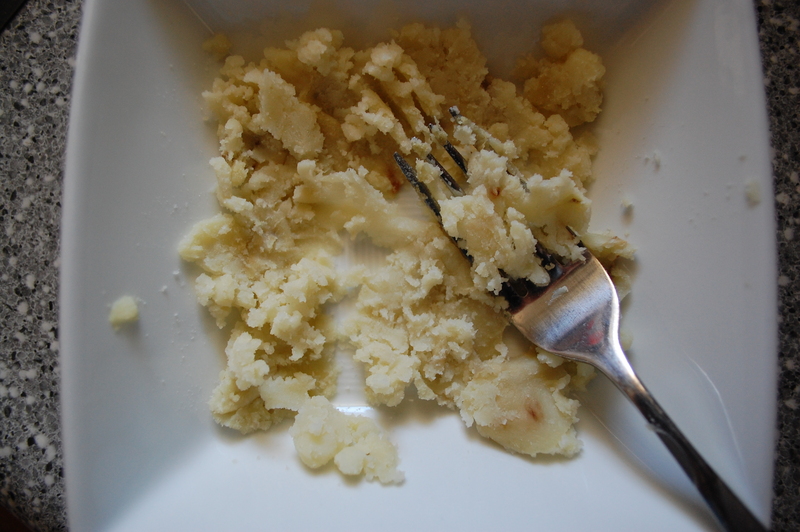 Indeed, that’s the first ingredient in the original version-but I substituted butter and it turned out splendidly. 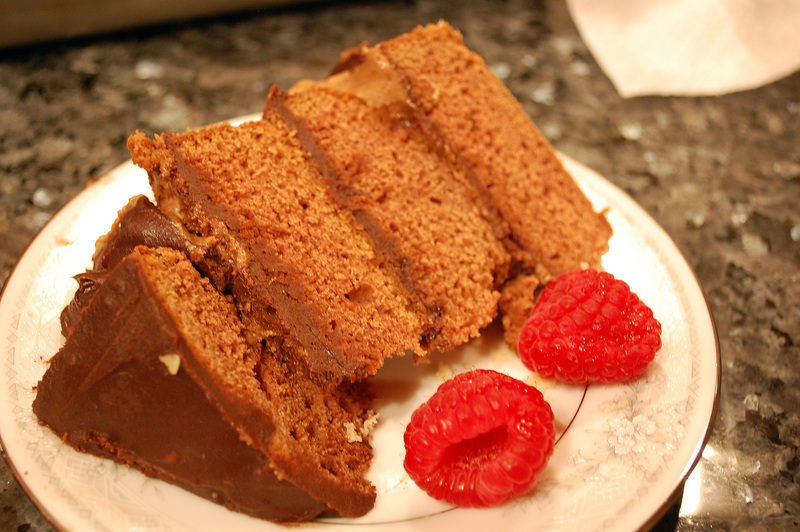 The original title of the recipe was “Rich Chocolate Cake” but the one teaspoon of cinnamon adds a depth and uniqueness to the taste-and I decided to change the title a bit to reflect it because the flavor doesn’t hide behind the chocolate. 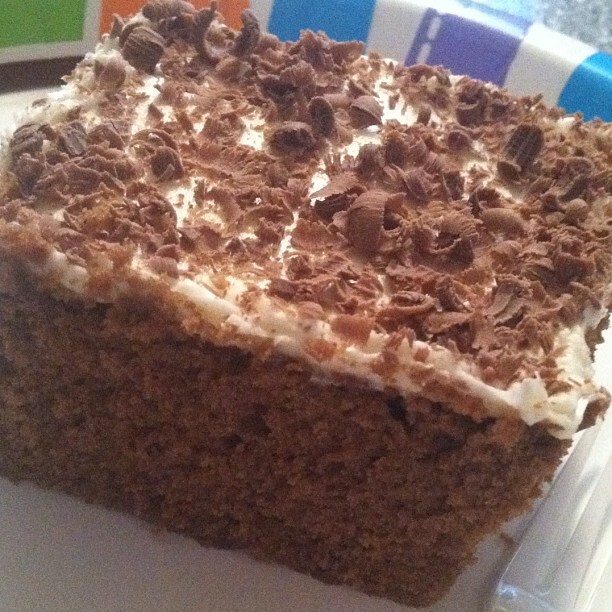 I’m saying this because, if you don’t like cinnamon, this is not the cake for you. If you do, here’s how you make it! Preheat oven to 350 degrees. Grease and flour cake pans (I used a 9×13 sheet pan). 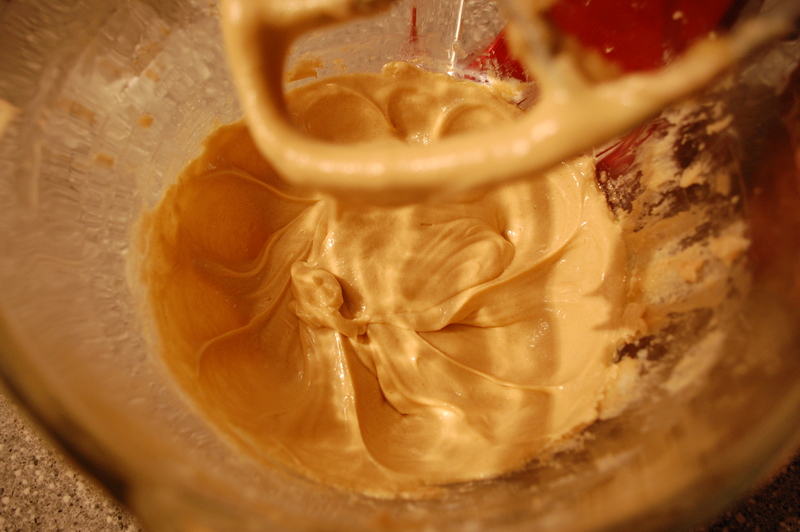 Cream butter and sugar together, adding a little sugar at a time to the butter until well blended. 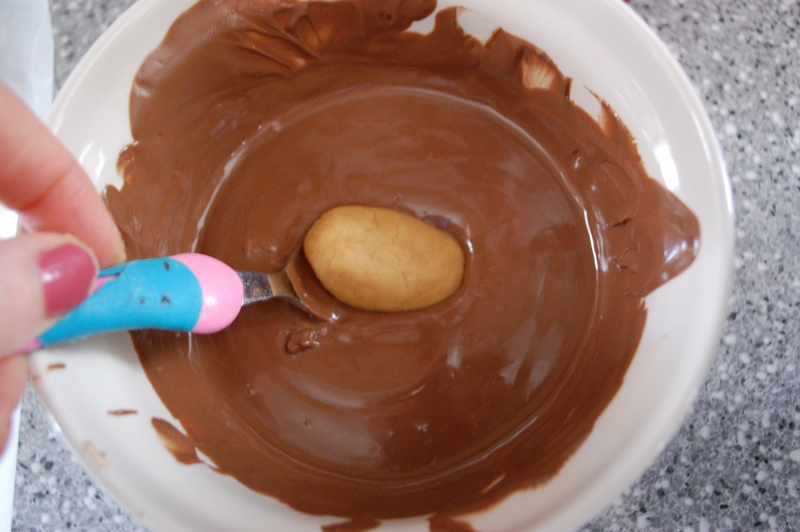 Melt the chocolate chips in your microwave. It took me about 5 minutes at 50% power. 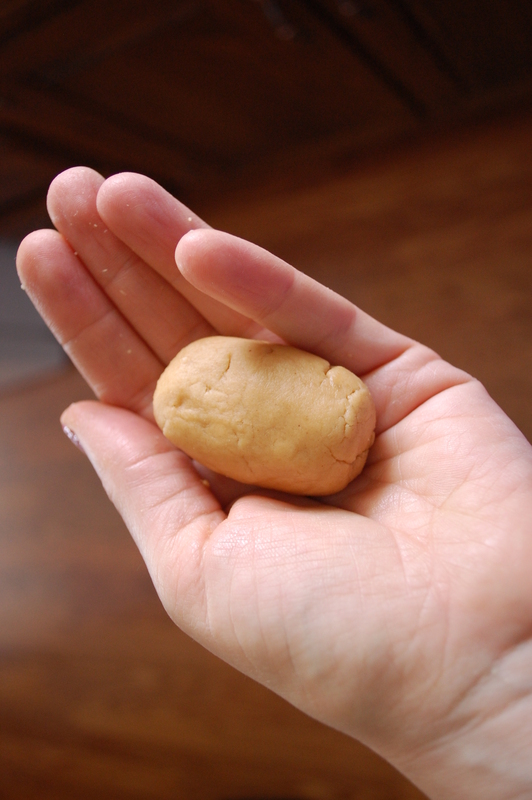 Stop every minute to stir the chips. 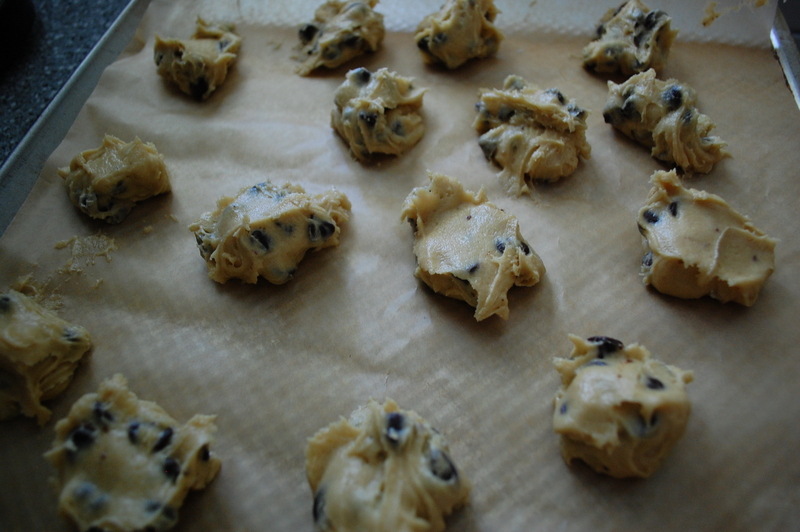 Add the hot water to the chocolate chips and stir well, then pour that into the creamed butter and sugar. 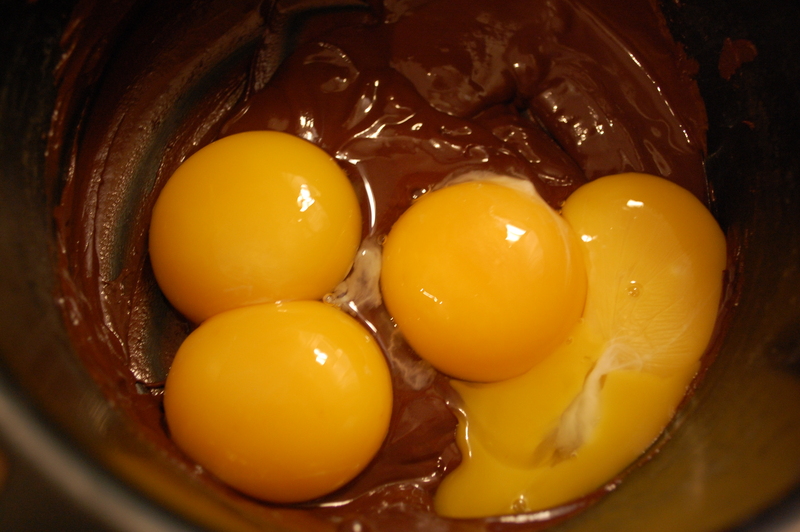 Beat the eggs yolks until fluffy and add to creamed butter/chocolate mixture. 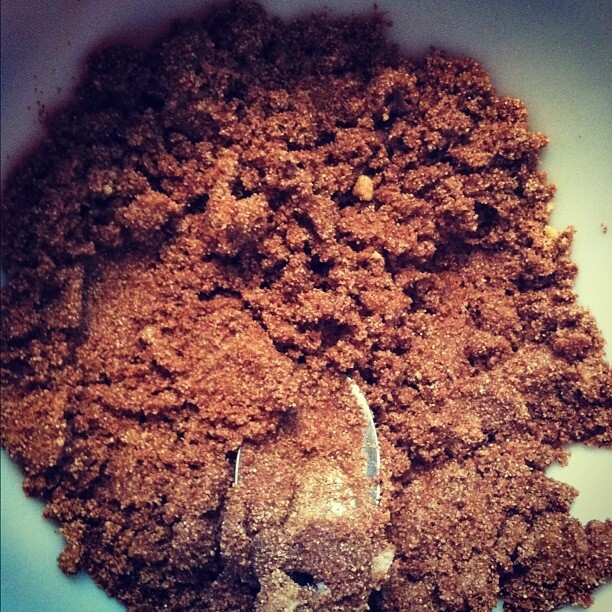 In a medium bowl, sift together flour, cinnamon, baking powder and salt. Add these dry ingredients to the wet, alternating with the milk until all are well-mixed. Add the vanilla. Finally, beat the egg whites until stiff and foamy and fold into batter. Pour batter into pan and bake for 30 minutes or until toothpick inserted in the middle comes out clean. I served it frosted with commercial vanilla frosting and shaved chocolate. The girls at the party loved it! It’s really a unique take on chocolate cake and I hope you enjoy it too! While skimming my copy of the Household Searchlight Recipe Book, published in 1931, one cookie recipe caught my eye-that for Cocomalt cookies. Cocomalt was a powdered drink additive, much like Ovaltine. Stores stopped selling it in the 1950’s, but before that, parents were told to add it to their children’s milk in order to keep them healthy. 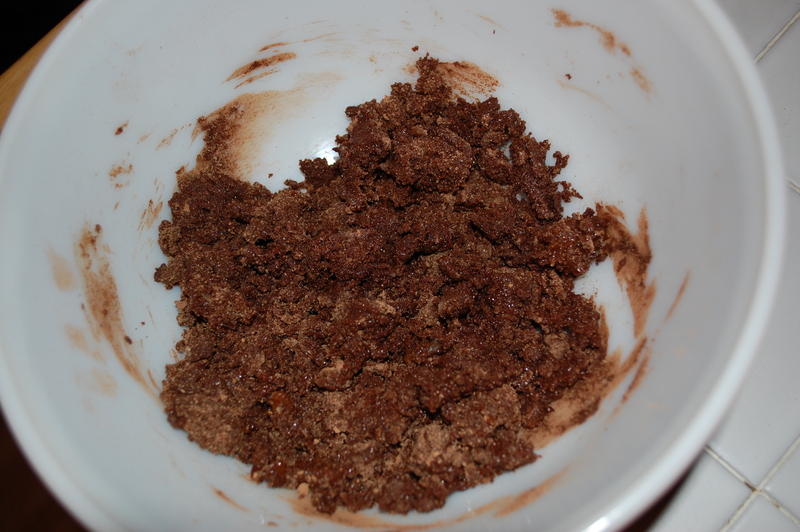 I was intrigued and thought I could recreate it, with a combination of chocolate powder and Cocoa-Wheats. 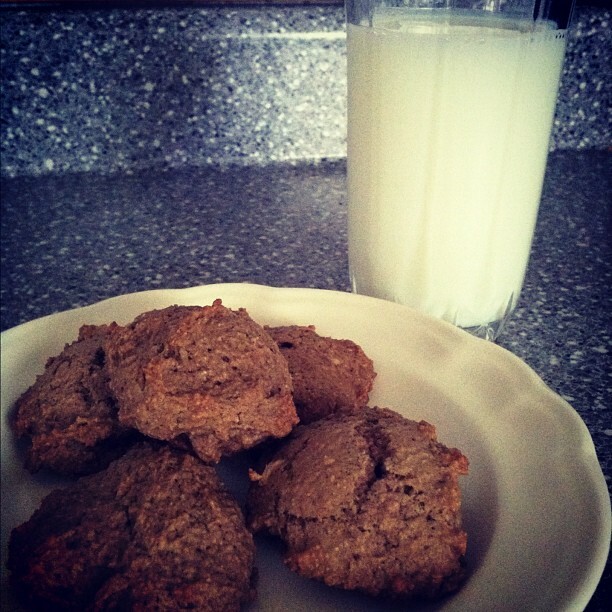 These cookies are not terribly sweet but still chocolatey and really good for you, at just 65 calories a cookie. Here’s the recipe. 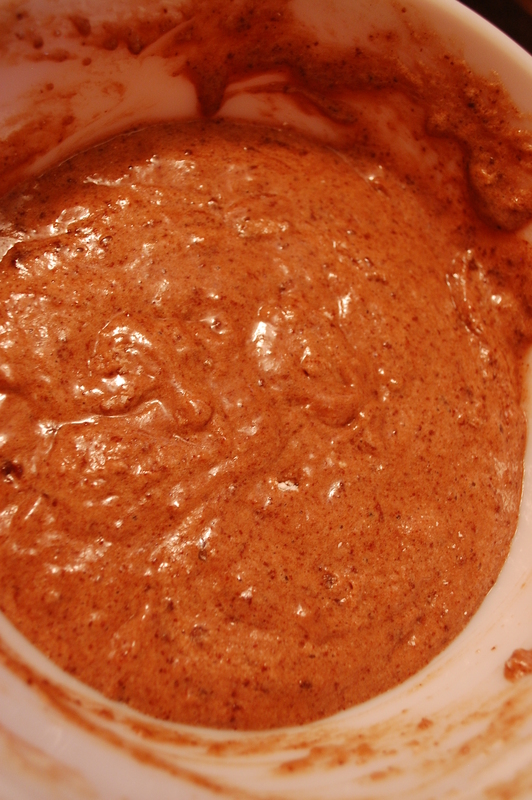 Combine sugar, cocoa powder, and Cocoa Wheats in a medium bowl. 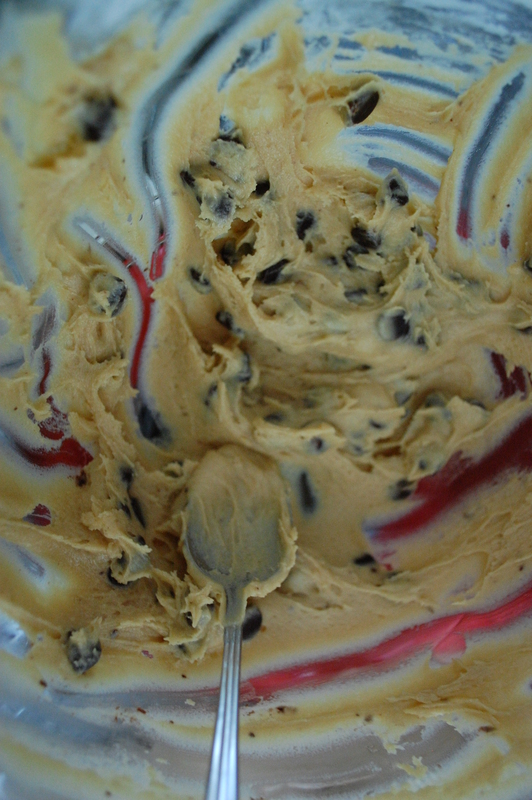 Add shortening and cream thoroughly (the dough at this point will resemble sand!) Add egg and mix well. 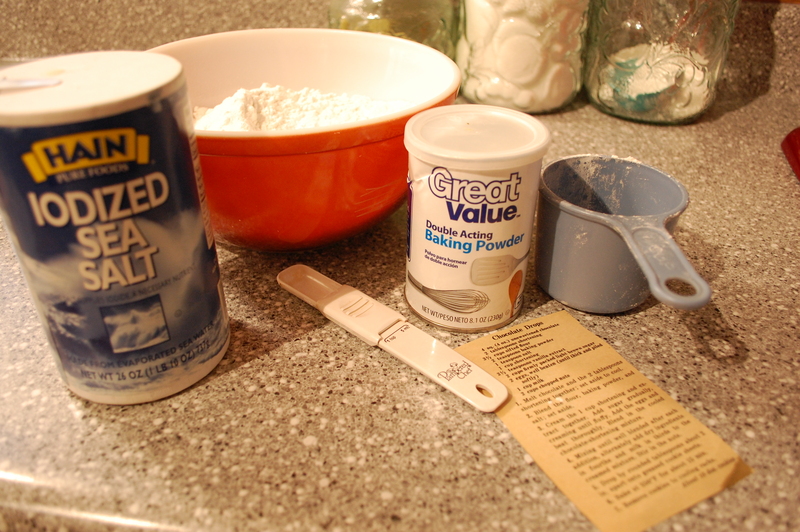 In another, bigger bowl, combine flour, salt, baking soda and baking powder. 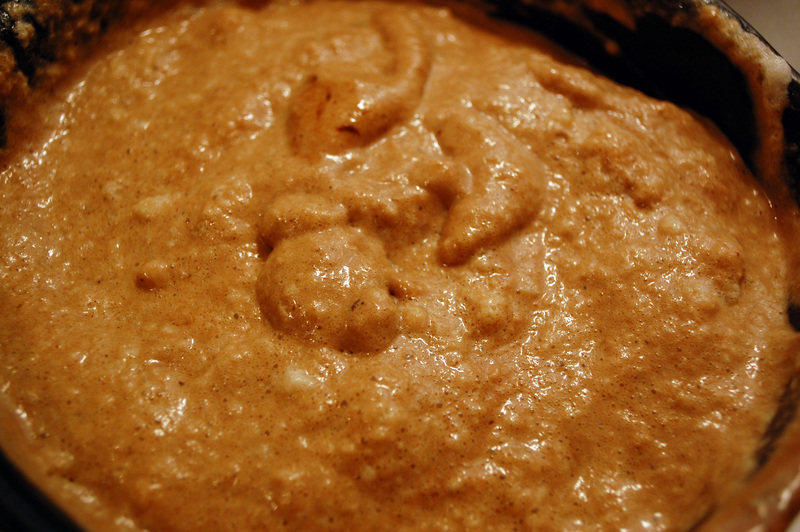 Combine the two mixtures gradually, alternating with milk, until you have a creamy, yet grainy dough. 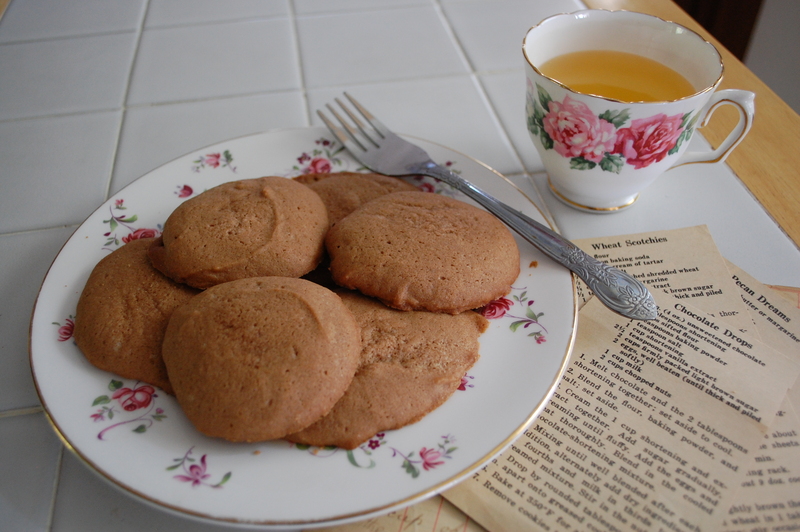 Drop by teaspoonful onto well greased cookie sheet. Bake for 9 minutes. That’s it! They’re not too sweet but they still give you that chocolate taste when you’re having a craving. Enjoy!